Gingival recession is the one of the commonest clinical features of chronic periodontitis and poses a great esthetic and functional problem to the patient. 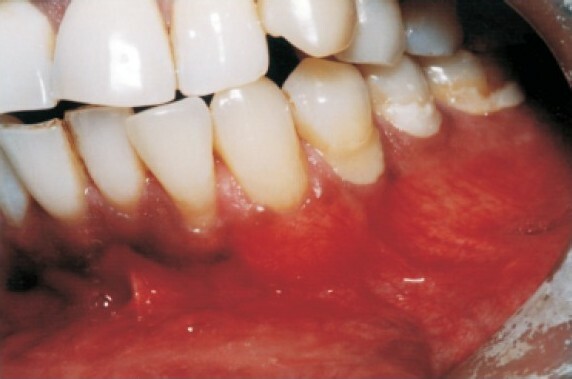 Several treatment modalities have been described in the dental literature to treat the localized gingival recession. In the present study, the efficacy of subepithelial connective tissue graft (SCTG) and the acellular dermal matrix allograft (ADMA) was evaluated and compared in the treatment of localized gingival recession. Nine patients with bilateral identical Miller's class I or II were selected and randomly assigned to treatment with either SCTG or the ADMA. Six months follow-up result showed significant clinical outcome in both the treatment groups in terms of improvement in recession depth, root coverage percentage, probing depth, clinical attachment level and the width of keratinized tissue. However on comparison between the two groups, no significant difference was found in relation to any of the parameters. Hence, it can be concluded that both the techniques (SCTG &ADMA) are equally effective in the treatment of localized gingival recession and restoring the esthetic and function. Achieving predictable and esthetic root coverage is the main objective of periodontal plastic surgery. 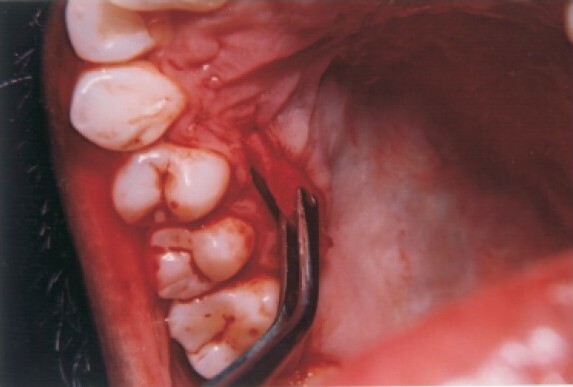 Several techniques have been developed to obtain the satisfactory results in root coverage procedures including the free gingival graft, semilunar flap, coronally repositioned flap, lateral sliding flap, double papilla flap and the subepithelial connective tissue graft. Recently, the guided tissue regeneration (GTR) membranes, acellular dermal matrix (Alloderm®) enamel matrix proteins (Emdogain), platelet rich plasma (PRP) and platelet rich fibrin (PRF) have been tried as the various treatment modalities, showing predictable esthetic results. The subepithelial connective tissue graft (SCTG) has been viewed as an effective and predictable method of achieving the coverage of denuded root surface in Miller's class I and II marginal tissue recession. This technique was first introduced by Langer & Calagna  in 1980 and later it was modified in 1985 by Langer & Langer. Since then various modifications were made in the incisions and designs of this technique to make it a treatment of choice for achieving a predictable coverage of root and implant surfaces and thus restoring esthetic and function in periodontology and implantology. Even though the SCTG is considered as gold standard in periodontal plastic surgery, it is associated with some drawbacks. 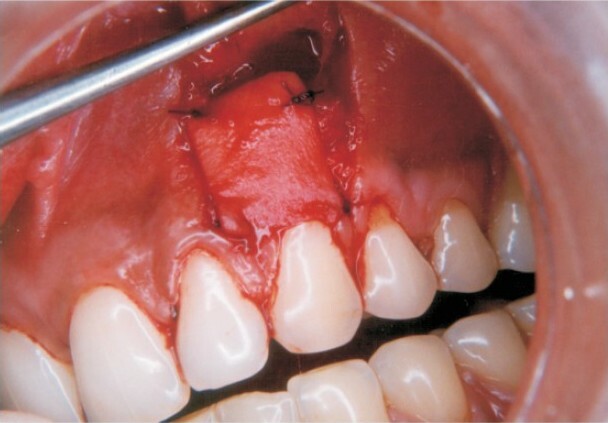 Recently, an acellular dermal matrix allograft (ADMA) has been approved as a substitute for the autogenous connective tissue graft in the periodontal plastic surgical procedures. It is a processed allogenic material obtained from human skin and rendered immunologically inert by removing the antigenic targets of cell mediated rejection; it has been used for the reconstructive purposes in burn patients. In periodontal surgery, the first, report of its use was presented for increasing the width of keratinized gingiva (Schulman, 1996),  implants (Silverstein & Callan, 1998)  and root coverage (Harris, 1998). Though it has a dermal origin, recent evidence indicates that the anatomic features observed in this kind of tissue are analogous to that of gingival tissue. The main objective of the present study was to evaluate and compare the effectiveness of subepithelial connective tissue graft (SCTG) and acellular dermal matrix allograft (ADMA) in the treatment of localized gingival recession. 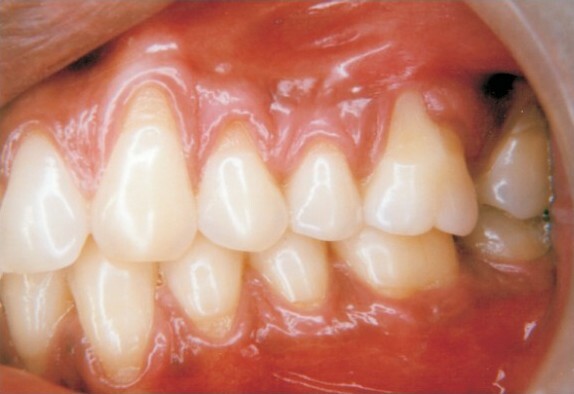 A total of nine patients (4 males & 5 females) in the age range of 26-48 years (mean 34.4 yrs) having bilateral Miller's class I or II gingival recession defects were selected for this study. The selection criteria included; 1) all patients with good systemic health with no contra-indication to surgery. 2) all the teeth were vital and had not received previous endodontic treatment or periodontal surgery. 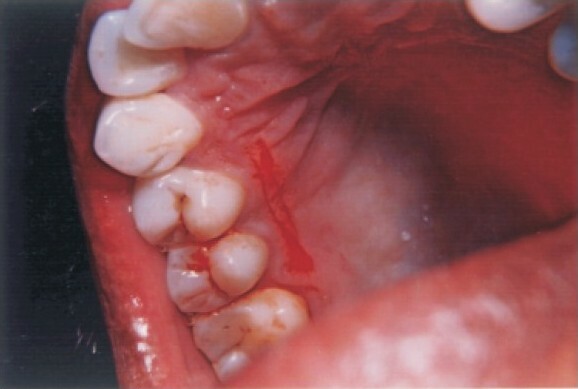 3) there was no bone or soft tissue loss in the interdental area. All the patients were given detailed instructions in self performed plaque control measures and were given multiple sessions of full month scaling and root planing. The patients were subjected to surgical therapy when they demonstrated acceptable proficiency in plaque control procedures. All the patients signed the written informed consent form for the study. Ethical clearance was obtained from the institutional ethical committee. This clinical study was planned in a split mouth design and all the selected 18 defects were randomly assigned for treatment with either connective tissue graft (control) or the acellular dermal matrix allograft (Alloderm®). 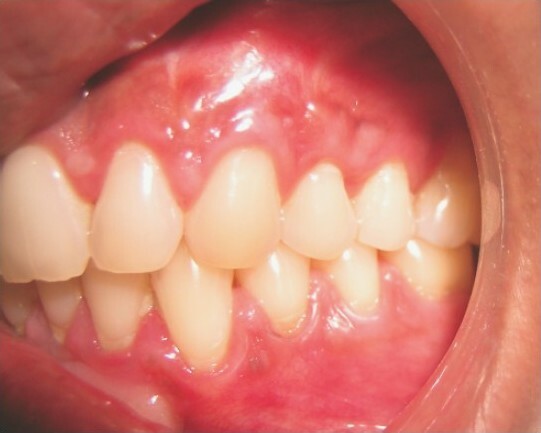 Clinical parameters like gingival recession, probing depth, clinical attachment level and the width of keratinized mucosa were recorded at baseline and 6 months postoperatively. Recession coverage was recorded in percentage at 6 months postoperatively. After oral scrubbing with Betadine (Povidone iodine 5%) and oral rinse with Chlorhexidine gluconate (0.2%), local anaesthesia (Xylocaine HC1 2% with 1:80,000 adrenaline) was administered and the patients were subjected to the following surgical procedure: The preparation of the recipient site was common for both SCTG and ADMAprocedure. Thorough root planing was done using fine Gracey curettes (Hu Freidy, U.S.A.). Deep crevicular incisons were placed and extended mesially and distally as far as necessary to permit coronal positioning of the flap to cover the graft. A partial thickness flap was designed close to the periosteum and extended until the flap could be passively moved. The flap was replaced back to cover the recipient bed and a saline soaked wet gauze piece was placed over the flap to prevent its drying anddessication. After measuring the size of the defect with a surgical template, the palatal area was anesthetized. The aluminium tin foil was used to outline the graft. A parallel incision 2 mm away from the gingival margin was placed palatal to first premolar / first molar region. Another parallel incision palatal to the first incision was given as per the Bruno's technique. Later, two vertical incisions were given on both sides to make the parallel incisions meet and finally the subepithelial connective tissue was procured. 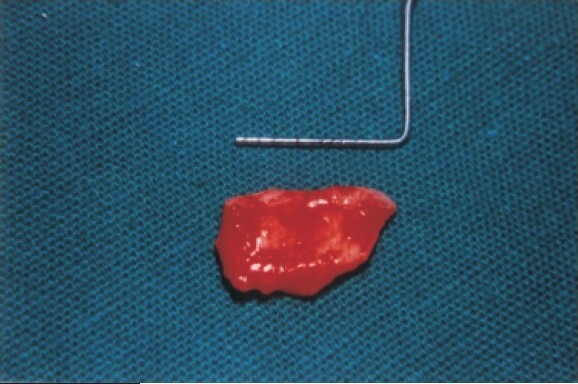 After its removal from the palate, the CTG was placed on saline soaked gauze and kept wet until its transfer to the recipient site. The donor site was closed by giving 4-0 silk sutures and hemostasis was achieved. The placement of acrylic stent over the operated site may be an individual choice. The connective tissue was trimmed and the epithelial collar was removed from the CT graft; then it was positioned on the recipient bed and sutured to the neighbouring mucosa with 4-0 silk. Both the donor and recipient sites were covered with the Co-pack (G.C. India). Alloderm® was rehydrated by placing it into saline and then cut into pieces as per the size of surgical template. It was placed over the bleeding periosteal bed and partially over the denuded root. 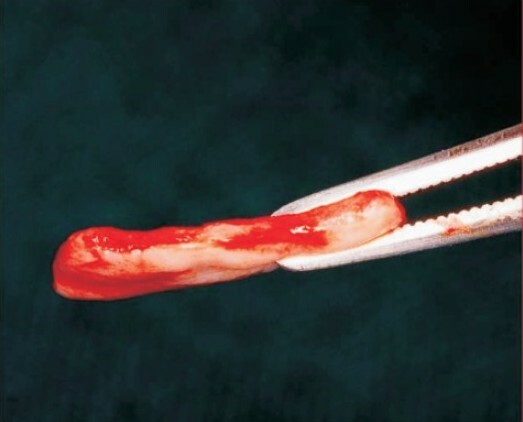 The connective tissue side of the graft was sutured against the bleeding recipient bed, and the basement membrane side was left as outer layer. Before suturing, light digital pressure was placed over the graft for better adaptation. 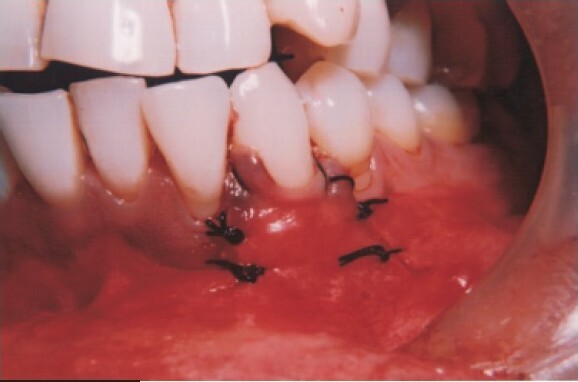 Interrupted 5-0 sutures were placed from acellular dermal matrix to the interdental papilla. 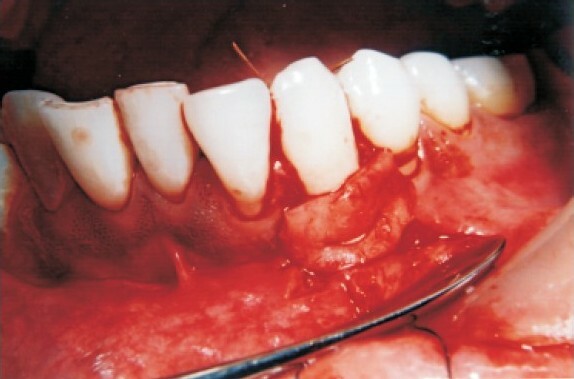 Mattress-crossed periosteal sutures from the base of the flap, anchored around the teeth and were tied over the graft for primary stabilization. The surgical site was covered with non-eugenol dressing Co-Pack (G.C. India), antibiotic (Amoxycillin 500 mg 8 hourly x 5 days), analgesic (Ibuprofen 400 mg thrice a day x 3 days) and chlorhexidine gluconate 0.2% twice daily as mouthwash was recommended. The periodontal dressing and sutures were removed on 10th day and patient was discharged with reinforcement of oral hygiene instructions. The patients were kept under maintenance program. At the end of 6 months, postoperative evaluation was done and clinical parameters like reduction in recession depth, root coverage, probing depth, attachment level and width of keratinized tissue were recorded. Finally all the data was statistically analyzed. In this split mouth design study, 18 gingival recession defects in 9 patients were selected. The defects selected were Miller's class I or II, representing identical nature on both the sides (bilateral) and were randomly assigned for treatment with SCTG (control) or with Alloderm® (Test group). All the nine patients completed the 6 month postoperative follow-up without reporting any complications. The clinical parameters like gingival recession (GR) was reduced from 3.23±1.08 (baseline) mm to 1.13±1.66 mm at 6 months postoperatively for the SCTG group thus achieving a reduction in recession depth of 2.10± 1.0 mm and root coverage of 86.6% which was statistically significant. For ADMA group, the GR was reduced from 3.16±0.81 mm to 1.13±1.06 mm from 0-6 months postoperatively thus achieving a mean reduction in GR of 2.03±0.83 mm and root coverage of 84.2% which was statistically significant [Table 1]. However on intra-group comparison the mean difference in the GR and root coverage between the two groups was statistically not significant [Table 2]. In SCTG group, the probing depth was reduced from 1.60±0.51 mm to 1.3±0.45 mm from baseline to 6 month postoperatively thus achieving a reduction of 0.1±0.66 mm. Similarly, probing depth was reduced from 1.60±0.51mm at baseline to 1.5±0.5 mm at 6 months postoperatively ADMA group [Table 1]. However, when probing depth reduction was compared between the groups, the mean difference was statistically non-significant [Table 2]. There was gain in clinical attachment level in both the groups. The CAL at baseline was 7.51±1.98 mm in SCTG group which reduced to 6.69±1.42 mm at 6 months postoperatively thus achieving a gain in clinical attachment level of 0.92±1.23 mm which was statistically significant. Similar trend was observed in ADMA group i.e. 7.55±1.33 mm (BL) to 6.39±1.19 mm at 6 months achieving attachment gain of 0.81±0.93 mm between baseline and 6 months postoperatively [Table 1]. However on intra-group comparison, the difference in mean gain in CAL was statistically not significant [Table 2]. The width of keratinized tissue at baseline was 2.00± 1.16 mm in SCTG group and it increased to 3. 0± 1.12 mm at 6 months postoperatively. The increase in width of KT was 1.0±1.04 mm was statistically significant [Table 1]. Similarly in ADMA group, the width of KT at baseline was 2.2±1.53 mm which was increased to 3.0±1.59mmat6monthpostoperatively[Table 1]. The increase in KT from BL 6 months was 0.8±0.75 mm which was also statistically significant. However on comparison between the group, the difference in gain in KT width was statistically not significant [Table 2]. Denuded root surfaces especially in the maxillary anterior region pose a significant esthetic problem, hence predictable coverage of denuded roots has been one of the important goals of periodontal therapy. Several techniques have been suggested in the dental literature, for the coverage of denuded root surfaces and restoring the esthetic and function. 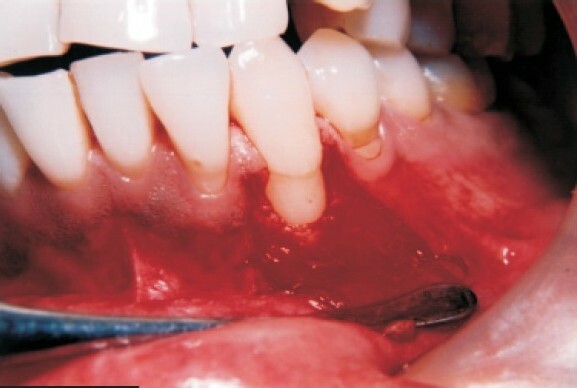 The present study was undertaken with the main objective of evaluating and comparing the effectiveness of connective tissue graft (SCTG) and the acellular dermal matrix allograft (ADMA) in the treatment of localized gingival recession. 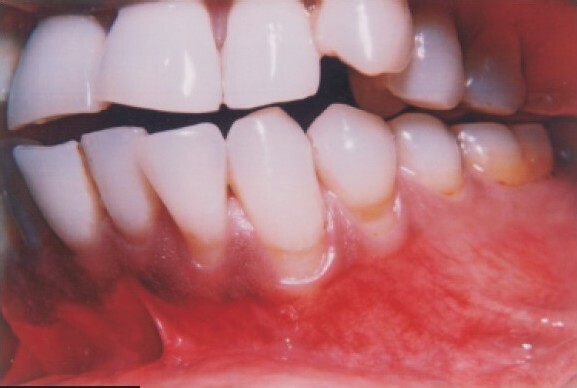 This split mouth design study was undertaken in 9 systemically healthy patients having identical gingival recession defects of Miller's  class I or II type. All the 18 recession defects were randomly assigned either to SCTG (9) or ADMA (9) group. Before surgery, all the patients were subjected to thorough scaling & root planing and odontoplasty to prepare the site for graft placement. However, no root conditioning was done in any of the cases as its role in wound healing is not fully substantiated. The predictability of connective tissue graft procedure in achieving acceptable root coverage is excellent because of the following advantages; 1) the blood supply is not compromised and thus the probability of graft survival is always high 2) it provides an excellent esthetics because of genetic effect on the overlying epithelium. However, it also has certain disadvantages; 1) it requires two surgical sites 2) the donor site may be associated with the postoperative pain, discomfort bleeding and patient morbidity and 2) this procedure is technically more sensitive. The treatment of gingival recession and the root coverage can be achieved by several different periodontal plastic surgical procedures. Every technique has got its indications and contraindications; and its advantage and disadvantages. In the present study, both the techniques (SCTG & ADMA) showed excellent and almost equivalent clinical results thus signifying their clinical utility in achieving an optimum root coverage and restoring the esthetics and function. However, future studies are recommended taking larger sample size and planning it with a longer follow-up. [Figure 1],[Figure 2],[Figure 3],[Figure 4],[Figure 5],[Figure 6],[Figure 7],[Figure 8],[Figure 9],[Figure 10],[Figure 11],[Figure 12]. 1. Scarano A, Barros RRM, Gioranna I, Piatelli A, Novaes Ab. Acellular dermal matrix graft for gingival augmentation; A preliminary clinical, histologic and ultrastructural evaluation. J Periodontol2009;80:253-259. 2. LangerB.CalagnaL. The subepithelial connective graft. J Prosthet Dent 1980;44:363-367. 3. Langer B, Langer L. Subepithelial connective tissue graft technique for root coverage. J Periodontal 1985;56:715-720. 4. Shulman J. Clincal evaluation of an acellular dermal allograft for increasing the zone of attached gingival. Pract Periodontics Aesthetic Dent 1996;8:208-210. 5. Silverstein LM, Callan DP. An acellular dermal matrix allograft substitute for palatal donor site. PostgradDent 1996;3:14-21. 6. Harris RJ. Root coverage with a connective tissue with partial thickness double pedicle graft and acellular dermal matrix graft: a clinical and histologic evaluation of a case report. J Periodontal 1998;69:1305-1311. 7. Miller PD. A classification of marginal tissue recession. Int J Periodontics Restorative Dent 1985;5:8-13. 8. Harris RJ. A comparative study of root coverage obtained with an acellular dermal matrix versus a connective tissue graft: Results of 107 recession defects in 50 consecutively treated patient. Int J Periodontics Restorative Dent 2000;20:51-59. 9. Aichelmann-Reidy MB, Yukna RA, Evans GH, Nasr HF, Mayer ET. Clinical evaluation of acellular allograft dermis for the treatment of human gingival recession. J Periodontal 200172:998-1005. 10. Novaes AB Jr, Grisi DC, Molina Go, Souza SLS, Taba M Jr, Grisi MFM. Comparative 6-month clinical study of a subepithelial connective tissue graft and acellular dermal matrix graft for the treatment of gingival recession. J Periodontal 2001 ;72:1477-1484. 11. Paolantonio M, Dolci M, Esposito P, et al. Subpedicle acellular dermal matrix graft and autogenous connective tissue graft in the treatment of gingival recessions: A comparative 1-year clinical study. J Periodontol2002;73:1299-1307. 12. Harris RJ. Acellular dermal matrix used for root coverage: 18-month follow-up observation. Int J Periodontics Restorative Dent 2002;22:156-163. 13. Tal H, Moses O, Zohar R, Meir H, Nemcovsky C. Root coverage of advanced gingival recession: A comparative study between acellular dermal matrix allograft and subepithelial connective tissue grafts. JPeriodontol2002;73:1405-1411. 14. Henderson RD, Greenwell H, Drisko C, et al. Predictable multiple site root coverage using an acellular dermal matrix allograft. J Periodontal 2001 ;72:571-582.